Tablet Computers have found there way into many aspects of life, and are among the most hoped-for gifts. Here a point-of-purchase iPad counts down to Christmas in retail, reminding all shoppers just how little time there is left to fulfill the holiday dreams of friends and family. Even the onscreen font is festive. 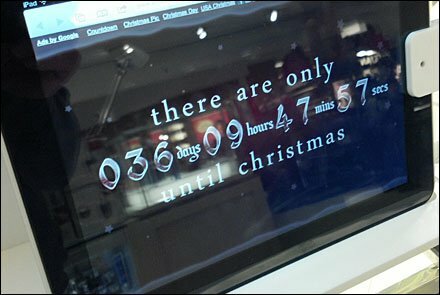 But should there be a secondary digital display counting down to Black Friday?